A selection of graphs and statistics on UK unemployment. 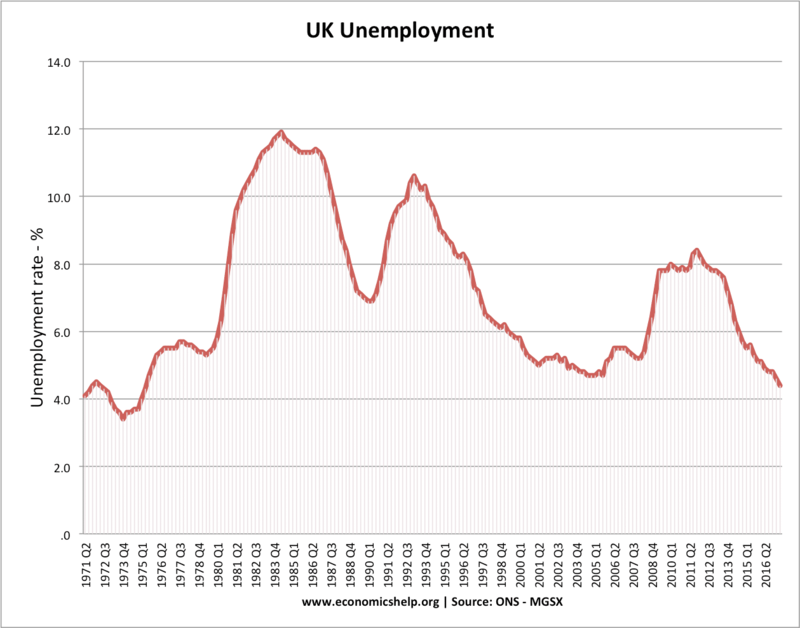 Also, looking at factors that explain UK unemployment and why unemployment has fallen in recent years. Employment: 32.136 million people in work. 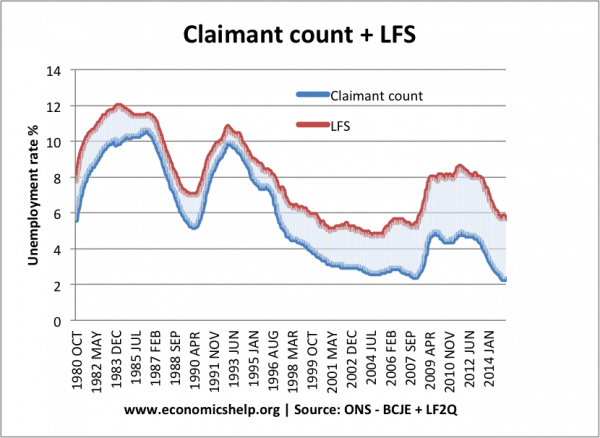 2.3% Aug 2015 – Claimant count is the number of people receiving the job seekers allowance. This is considerably less than the official measure of unemployment. The claimant count is the number receiving unemployment benefits. The labour force survey involves asking people if they are currently out of a job and actively seeking work. Some people unemployed may not be eligible for job seekers allowance. Recent changes have made it more difficult for the unemployed to get work. Unemployment rose to a post-war peak in 1982 (12%) due to the recession of 1981. The unemployment was concentrated in former industrial areas, which suffered from falling output during the early 1980s. Unemployment did not fall below 3 million until the mid-1980s, when the economy started to boom. Another recession in 1991, caused another rise in unemployment to over 3 million (10%). During the long boom of the late 1990s and 2000s, unemployment fell to a low of 5%. This was near full-employment. In 2008, the deep recession caused a sharp rise in unemployment due to people being laid off in the recession. 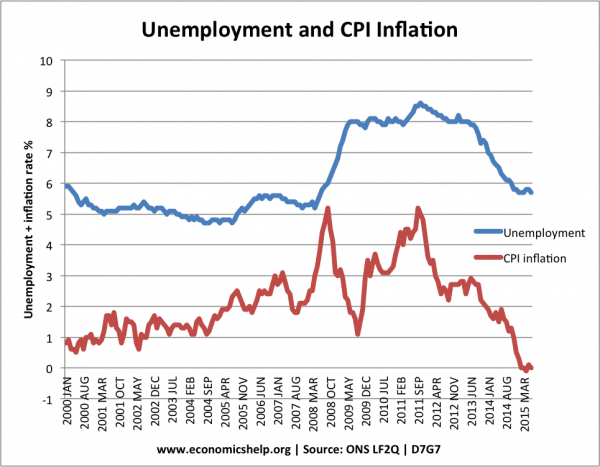 Why has unemployment fallen during the prolonged recession of 2008-14? A fall in labour productivity, meaning that firms have been willing to keep on workers, despite falling output. Benefit changes making it harder to get job seekers allowance and encouraging more people to seek jobs. A rise in disguised unemployment / under-employment – shorter working hours. 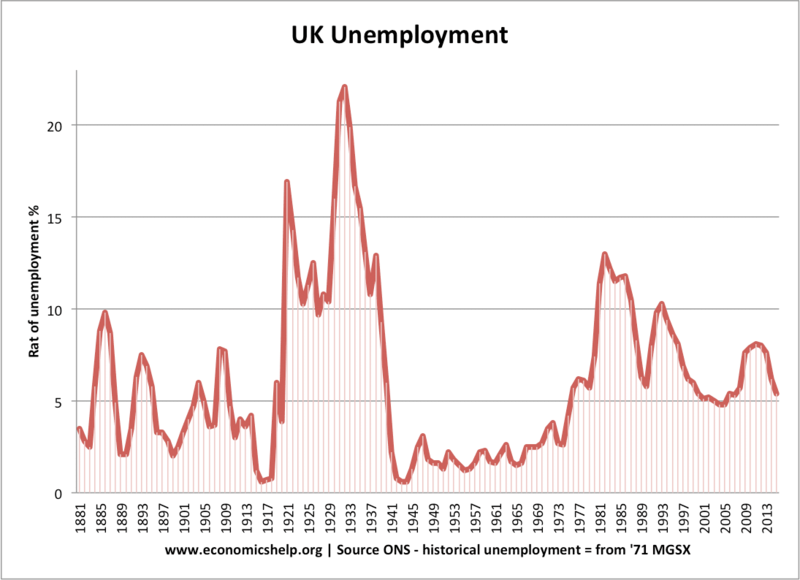 See also: The UK unemployment mystery – why unemployment is lower than might be expected. Recession – causing cyclical, demand deficient unemployment. With falling real GDP, firms are producing less and therefore, there is less demand for workers. Also in a recession, some firms go out of business causing people to lose their jobs. Structural factors. There is structural unemployment due to the fast-changing nature of the economy. For example, manufacturing jobs have been lost due to the economy becoming more service sector based. Some unemployed workers have found it difficult to get jobs in new high tech industries because they lack the relevant skills. Geographical unemployment. Unemployment is higher in certain regions and particular areas (e.g. north). There are geographical immobilities making it difficult for the unemployed to move to the south, where more jobs are available. Frictional unemployment. There is always some unemployment due to frictional factors, e.g. it takes time for the unemployed to find a new job. 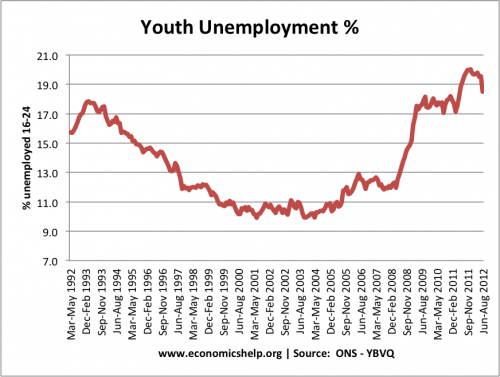 Youth Unemployment is highest amongst young workers – often because they lack skills or the right motivation. The Phillips Curve suggests there is a trade-off between unemployment and inflation. Higher economic growth helps reduce unemployment, but inflation is likely to increase. By contrast, a reduction in demand would cause job losses and unemployment to increase but reduce inflationary pressure. However, in the real world, many other variables can lead to a breakdown in this trade-off between the two. 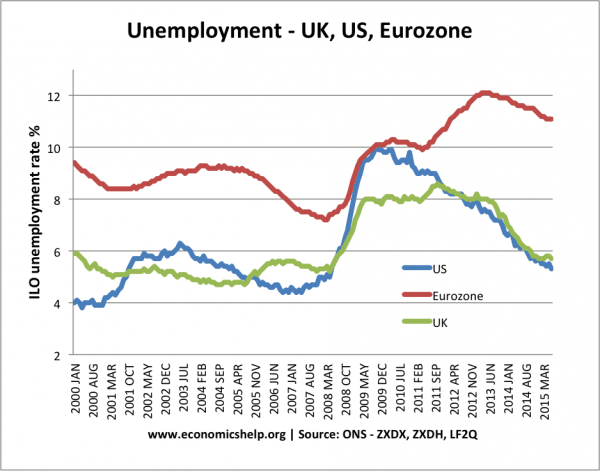 Fall in unemployment in UK and US. But, Eurozone unemployment now significantly higher. This entry was posted in A-Level, stats and tagged a-level, graphs, unemployment. Bookmark the permalink. Thanks for your info It helps me a lot.